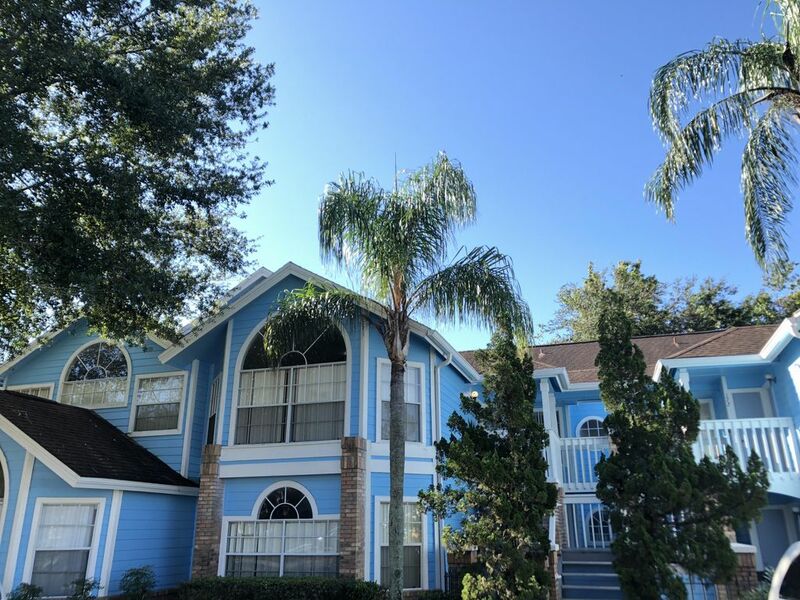 This luxury three-bedroom / two-bath condo, located within the 'Villas at Somerset' resort in Kissimmee, Florida, sleeps up to eight and is located 10 minutes from the maingate of Disney World/ Hollywood Studios and Disney Springs. There is the new Pandora area within the Animal Kingdom and the new Toy Stories theme within Hollywood Studios. The Universal Studios, Islands of Adventure, Wizarding World of Harry Potter, City Walk, Volcano Bay, International Drive, and SeaWorld are just a short drive away. The many coastal beaches and Kennedy Space Center is approx. a short 50 minute drive. The condo offers all the amenities such as A/C, full kitchen, flat screen 32 and 40 inch cable TV; DVD Blu-Ray player, washer/dryer, wireless internet, and plenty of space. There is a pool, jacuzzi, BBQ area, tennis, fitness room, internet access, game room, and sauna available within the resort area. There is food and drinks available at the pool. In addition, for your nightly enjoyment and entertainment, there is the Seminole Hard Rock Cafe Hotel and Casino, located approx one hour away, off of West I-4 (Tampa). The casino offers Bacarat,Slots,Poker, Craps and BlackJack. Detroit Tigers in LakeLand and Yankees in Tampa Florida. There are many discount Premium Outlet locations at (Lake Buena Vista / International Drive) and high end retailer shopping (Millenium Mall, Florida Mall) available all within a short drive. I , am a IT professional, working for a financial institution. I believe it is a excellent choice to stay for your Florida / Disney location. It is approx. 10 minutes to main gate Disney , Disney Springs and 15-20 min to Universal Studios, CityWalk and Seaworld. The condo has all the amenities that you and your family would need for a successful and enjoyable vacation. Cape Carnaveral and Cocoa Beach is the closest...APPROX a 55 MIN. DRIVE. Clearwater beach on the gulf side is approx. a 1 hour and half drive. Many Private/Public golf courses in the Kissimmee/Orlando area. Falcon's Fire is the closest golf course. Very clean and well equipped unit. Friendly and safe community. Condo was well cared for with great location relative to the parks/resorts. Thank you donna for the nice comments. I'm glad your family enjoyed their stay at my florida condo. Excellent accommodation. Very clean and well kept. Will be looking forward to booking this property again. The surrounding area from the 'Villas At Somerset' resort consists of many restaurants, tourist attractions and pubs. There is the OLDE TOWN Amusement area that provides many rides for the family, restaurants and shopping. Other Activities: Just outside the resort, there are many fine dining establishments such as TGI Friday's, Olive Garden, Red Lobster, Black Angus SteakHouse, Smokey Bones, CiCI Pizza, Flippers Pizza, WingHouse and Perkins Restuarant. all within a short walk or drive. Just a 10 min. short drive to all the Disney theme parks and Disney Springs (formally Disney Marketplace) are available to you. The Universal Studios / Islands of Adventure theme park with the new Wizarding World of Harry Potter and Diagon Alley , King Kong Skull Island, along with CityWalk, Seaworld, Discovery Cove, Olde Town, Kennedy Space Center and the New 'LegoLand' theme park are all within a short driving distance. There are many beaches like Cocoa, Daytona, Melbourne, New Smyna, and Clearwater are within a short drive. There is also the Seminole / Hard Rock Hotel / Casino located for your adult enjoyment available in Tampa, FL., which is only a one hour drive on Route 4 (West) off Hillsborough Ave Exit and Orient Road. The casino provides gaming activities such as Baccarat, Poker, Slots, and Blackjack. There are also many restuarants and enterainment available for your enjoyment. Golf: There are many public Golf courses available for your use, around the Orlando/Kissimmee area.